The whole India is now suffering from having less cash. Demonetization is seriously effecting many people. However, this step is taken to improve our economy and within few months everybody will start getting benefits from this Step. But what to do now? how to do daily shopping without cash? India is a country where 78% of transactions are usually done in cash. This is why people prefer paying their bills in cash. But this habit of paying bills in cash leads to black money. In many cases customers do pay the full sum including all taxes, but retailers/shopkeepers hide that sale from the government to save some tax. India is such a big country and this small small savings contributed a lot in the creation of black money. Recently Rs 500 and Rs 1000 notes are banned by our Government and asked everybody to exchange their notes. Almost everybody is now fighting with black money by not accepting Rs 500 and Rs 1000 notes. So, how can you pay your bills of Milk, Groceries, Clothes and other necessary service? In the next few months there will be enough new currency to buy and sell products but till then we have to get a reliable way to do transactions. As the evolution of digital India is in faster pace, there are many e-wallets in the markets. Initially they were giving cashback and other offers but with certain conditions. Not 1 e-wallet was enough to fulfill all our basic needs. That's why I decided to compare all current e-wallets and found that JioMoney is what I was looking for years. There are so many features of JioMoney that are sufficient for all your basic needs and I would like to explain all those features here. Basic Account: There is an upper limit of transactions worth 10,000 INR per month. To open this type of account yo do not require to provide any documents for verification. Just download the app and start using it. Advanced Account: This account is for heavy users like shopkeepers/Retailers who required to do bigger transactions per month. This Advance Account is for premium customers and they can add upto 100,000 INR in their JioMoney wallet. However, their is currently no limit on transactions and you can make unlimited transactions above 100,000 INR. Anybody can have a JioMoney wallet. All they need to have is a valid Mobile number to signup for a JioMoney Account. Just download 'JioMoney Wallet' from App Store/ Play store, Install, signup and start using world's best e-wallet. In case, you lose your smartphone, your money will be 100% safe. Only you can access your JioMoney account with your Password and a 4 digit mPIN. In case someone is trying to access your account, JioMoney account will be locked if 3 consecutive Incorrect attempts made. If you think that someone is using your account like if you see unusual activities, you can immediately suspend your JioMoney account just by calling 1800-891-9999 or by writing email to care@jiomoney.com. Prefer to call on toll free number first in case of urgency. JioMoney is the best and safest way of doing cashless transactions without paying any charges and worrying about expiry dates, as there is no expiry dates of JioMoney Wallet. Jio 10% CashBack offer, what’s the deal?! 10% cashback is what we are always looking for. We Indians love to get something extra and that's why we try to do bargain with local shopkeepers. But now, JioMoney is here with 10% flat cashback without any terms and conditions. While in case of other e-wallets most of the coupon codes are usually expired or the offers are like up to 10% cashback and you will never get 10% cashback in any case. So, the hassle free JioMoney wallet is good for easy transaction and also getting unconditional 10% cashback. People nowadays are thinking about how to do shopping with 2000 INR notes while customers of JioMoney wallets are enjoying easy and rewarding transactions. The cashback will be credited in 2 working days and that is guaranteed. So, with JioMoney i can pay any amount without tension of having change. You can use your wallet at any Reliance Fresh & Reliance Smart stores and over 50,000 online merchants & 70 plus billers across India. Another great feature of JioMoney is that you can get cash just like you get from ATMs. 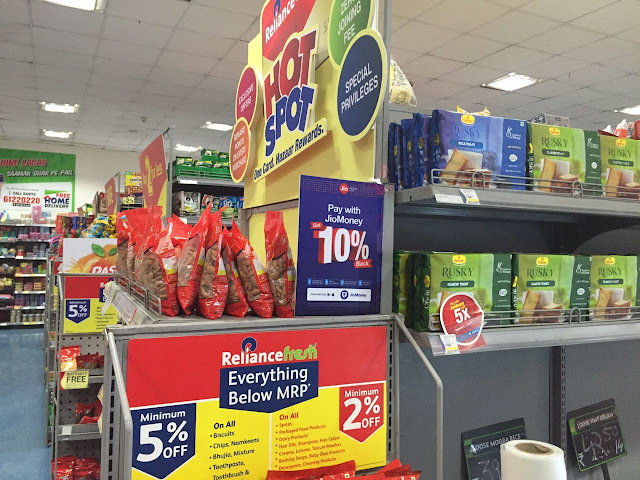 So, just head over to Reliance stores and get as much cash you want. With Jio Money forgot what standing in queues feels like. No doubt JioMoney is the first online E-Wallet which is providing this feature and now other commercials are trying to do so.